Not even 24 hours after the first Buffalo Bills preseason game, the Bills have already made a huge splash on the roster. The Bills have traded away star-players Sammy Watkins and Ronald Darby. Watkins has been traded to the Rams in return for CB EJ Gaines and a 2nd round pick in the 2018 NFL Draft. Darby was exchanged for WR Jordan Matthews and a 3rd round pick from the Eagles. Honestly, I don't expect that many people thought this was coming. Nearly every fan has been scratching their head, and many are shocked, angry and frustated with the trade. In fact, the word "tank" has been mentioned many times, but take it easy Bills fans. Look at the entire picture. This trade, in my eyes, definitely alters the team dynamic, but it certainly doesn't mean the team has gotten worse. In fact, I think these trades may even fit the team's dynamic a bit better, and provides more insurance as well. The picks, at face value, are certainly an upgrade right out of the gate. Buffalo now has 2 1st round picks, 2 2nd round picks, and 2 3rd round picks in this year's draft. Let's get a little bit more into each player obtained. I think many people are overlooking Jordan Matthews as a WR. He is an underrated WR, who brings a different dynamic to the team than Sammy did. Matthews may not stretch the field as much as Sammy would, but he's a versatile possession receiver who still can provide a deep ball threat. In fact, Matthews is 1 of just 5 receivers in the NFL to have 65+ receptions and 800+ yards in his 1st 3 seasons. Matthews upgrades the height of the WR core as well, as Matthews stands at 6'3". He's a "go-get-it" type receiver who also has a physical nature as well. Matthews reliability and durability has also been proven, as opposed to the risk Sammy always seemed to face. Matthews has missed just 2 games in the course of his 3 season career. Watkin's health has always been a concern, but with this acquisition of Matthews, that concern is no more. Matthews will be there, when you need him. This trade, overall, makes a lot of sense. You sacrifice some playmaking ability, but in return get a solid possession receiver who is extremely reliable. Matthews may also provide for a quicker, more efficient passing offense for Tyrod Taylor and company. Not to mention, Buffalo no longer has to worry about losing Watkins for nothing at the end of the season if they elect to not resign him. Along with replacing Sammy Watkins, Buffalo also managed to replace Ronald Darby the best that they could. Buffalo acquired EJ Gaines today in their trade with the Rams. Gaines, who stands at 5'10", 190 lbs, is a smaller CB, but still provides a bit of insurance for the defense. This team is running a 4-3 this season, which means Buffalo will be running a bit more zone defense, which is something that Ronald Darby had troubles with at times. Gaines provides the upgrade as he is familiar with a 4-3 scheme and may even fit the scheme better. Gaines has NFL experience, being around since 2014, and despite missing the entire 2015 season, will look to bounce back from quite frankly an average 2016 campaign. This move may make rookie Tre White the #1 corner on this roster, but that may not be a bad thing. McDermott trusts White heavily, and wouldn't give him this role if he didn't feel he could handle it. Gaines certainly isn't the highlight of these blockbuster Buffalo trades, but he may serve as a piece to the defense's success this season. Overall, the big picture is this; Buffalo seems to be looking to retool on the fly, but without making a lot of high risk moves to do so. Also, it appears their goal is still to win this year. In any trade, getting players back often means that the team is still trying to win, and that they see value in the players acquired. In this situation, Buffalo dodged the potential bullet of another Sammy Watkin's season-ending injury, and having him walk away for nothing. I think Buffalo downgraded in the Darby trade, but will still find Gaines serviceable, and they managed to get a couple key draft picks. It's a new day here in Buffalo, and unfortunately, the Sammy era has come to an end. It's time to look ahead, and I believe Buffalo has improved the roster and future with these trades. Thanks for reading, and as always, Let's Go Buffalo! The Bills have 13, yes, 13, WR's on the current roster. That is a crazy amount of depth. The Bills may only keep 5 receivers, but may keep 6 if they elect to run with only 2 active QB's. There's a lot of combinations here, which is great for the Bills staff. Sammy, Zay Jones, and Boldin will seemingly have the 1st 3 spots locked up, and that will leave the 3 remaining spots or so up for grabs. The receiving corps of the Buffalo Bills is a rather young one, with nearly half of the 13 WR's 25 or under. The presence of a 36 year old, who's seen it (and won it) all, will certainly be a huge advantage for Sammy Watkins and Zay Jones, and even for some of the older guys who might be 26 or 27. There's always room for improvement, and with Boldin providing some pro-tips of his own, every WR will be better off. The Bills have always struggled in the redzone, which has never been a secret. Every offseason, the same old discussion goes on; "We need to draft a redzone target," or "Bills need to get a big WR for the redzone in FA," etc. The Bills have now gotten one more to add. Boldin's not the tallest guy, standing at just 6'1", but his 220 lb frame and physical style will certainly be able to fight for his ground in the redzone. Add him with Sammy Watkins, the 6'4" Andre Holmes, Charles Clay and even the 6'6" QB-gone-TE Logan Thomas, the Bills will not be short in the "Redzone Target Department." Overall, there is not one bad thing about this signing. Boldin's health seems to be the only concern here, as he is 36 years old. Still, he continues to produce at a #2-#3 WR level in the NFL, which is extremely suitable for what the Bills need. His veteran presence, his physical style, and his leadership will be a huge addition to the Buffalo Bills this season. This signing has a chance to put the Bills offense over the top, especially with the likes of Sammy Watkins, Shady McCoy, Zay Jones, Charles Clay, and Tyrod Taylor. Thanks for reading, and as always, Let's Go Buffalo! Thank you, and as always, let's go Buffalo! It's official, Training Camp practice is here! The players are all moved in and ready to go, and just concluded their first practice today. Training Camp will be competitive as usual, as many of these fresh faces look to make an impact and solidify their spot on the 53 man roster. Even after today, many position battles are already brewing. There are a few key ones to look out for in the coming weeks. After Sammy Watkins and Robert Woods, the Buffalo Bills receiver depth is foggy. There are currently 12 wide receivers on the Bill's roster right now, and that number will lost likely fall to 5 or 6 once the 53 man roster is set in stone. There's several key names to look out for, including Dezmin Lewis, rookie Kolby Listenbee, Greg Little, Greg Salas, and Davonte Allen, another rookie. The coming weeks will hold a lot for this team, and the best receivers will rise to the top. Stephon Gilmore and Ronald Darby are holding down the top 2 spots, but after that, there's some indecisiveness of who holds the final few spots. Nickell Robey-Coleman, formerly Robey, is believed to remain the 3rd CB, but with some new faces, such as Corey White and Sterling Moore, the final few spots will be tough to grab. The Bills will have a tough choice, but keep an eye on these players. Lesean McCoy is of course holding it down as the #1 back, but with him aging, it is likely that the backup and 3rd string backs will see increased snaps this season. Both Karlos and Johnathan Williams got themselves in trouble, which leaves the door open for new faces, like James Wilder Jr. and Mike Gillislee. Add in Reggie Bush, if the Bills sign him, and the Bills have a stacked backfield. 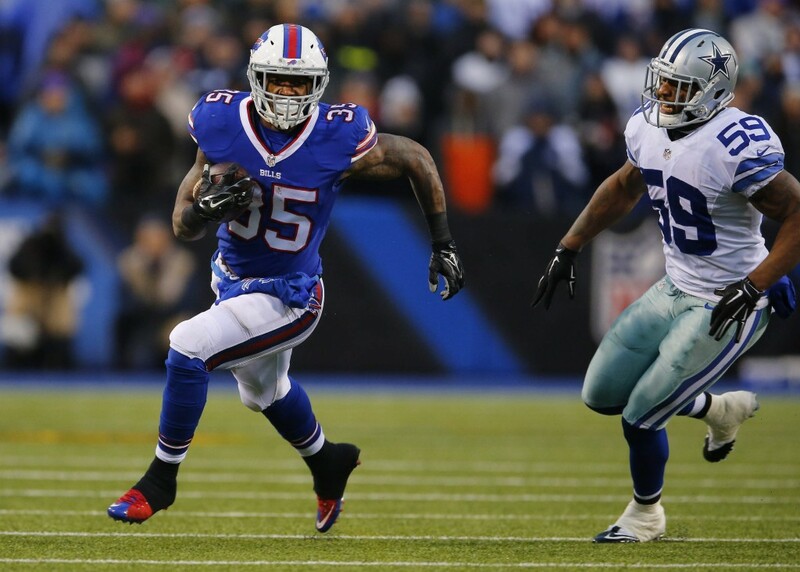 Only 3-4 backs will make the roster, so the competition will be very tight behind Shady. Look out for Wilder Jr, he appears to have the potential to be a real stud in this Bills #1 rushing attack. Competition will be tough, as usual, but with our starting QB set in place, it's time to turn to other battles going on in camp. There's a lot of talent on this team, but it must all come together to be an impact in the NFL this year. Thanks for reading and as always, let's go Buffalo! "I told our players to 'win July'. We won the offseason," Rex Ryan states at a post mini-camp presser back in June. We are now in mid-July and as training camp approaches, the Bills are not "winning July." In fact, some could say they are losing July. The past few days have been not pretty for the Buffalo Bills running backs, as Karlos Williams and Jonathan Williams alike find themselves in hot water. 2016 5th round pick, Jonathan Williams, was arrested this past Thursday morning and is now facing a DWI charge. Karlos, who had already shown up to mini-camp much overweight, has been suspended for 4 games after violating the NFL's PED policy. Karlos, the rookie standout, is not having a great start to his 2nd season in the NFL, and Jonathan is not having an ideal start to his NFL career in general. Both backs were expected to be productive in this offense, but in the world of sports, the show must go on. Losing any player for any amount of time is not ideal, but with a backfield like Buffalo's, they can afford some absences if they need to. Buffalo's backfield is one of the best in the NFL, filled with talent top to bottom. Even With Karlos and Jonathan Williams out, this RB corps can still be dangerous. Led by the horse of the offense, Shady McCoy, Mike Gillislee, James Wilder Jr, and Boom Herron, it's still not a backfield to sleep on. We know all about what McCoy can do, but Gillislee and Wilder are sneaking under the radar headed into camp and into the upcoming season. Gillislee made his first splash in Buffalo against the Houston Texans on December 6th, 2015. Since then, he's made his presence known as a Buffalo Bill, getting a contract extension after putting up 47 carries for 267 yards and 3 TD's in 5 games played. Gillislee stands at 5'11" and weighs 208 lbs. The 4th year back is a one-cut type running back who can pick up speed quickly once he hits the open field. The open field is truly where he thrives, as he can separate himself from defenders when he puts it into 2nd gear. Not to mention he can really make a defender look silly, as he can perform solid cuts. His production will be expected to jump in 2016 as he will be in the regular rotation for the first several games of the season. James Wilder Jr. is an interesting player as he has a lot of mystery of what he can actually bring to the table. Wilder was brought in on a future/reserves contract on January 20th, 2016. Since he was signed, there's been a lot of fan hype online about what his potential may be, as his highlight reel shows he is a sturdy back [standing at 6'3" and weighing 232 lbs], who can throw men around and bounce off tacklers. The 2nd year player appears to be an excellent downfield runner who can put his head down and gain extra yards through his "second push." He's not afraid to dive for the endzone, or that extra yard either. His speed also assists in his contribution in the passing game. As a gritty, quick, all-around back, it looks as if Wilder could be an excellent addition for the Bills if he can reach his full potential. Buffalo's done an excellent job finding RB's for the team, and the depth they've stockpiled may really begin to be seen this upcoming season. As for Karlos and Jonathan Williams, they've got to get it together. The poor decisions they make hurt themselves as well as the team. In the mean time, Gillislee and Wilder will look to training camp and the season, as they would love to make a great impression to the coaching staff. Thanks for reading, and as always, let's go Buffalo! How Much Is Stephon Gilmore Really Worth? The NFL has been pretty quiet the past couple of weeks since mini-camp finished up, but there are still some "elephants in the room" as far as contract situations go. Buffalo has a few of them on their hand, such as Tyrod Taylor and Stephon Gilmore. The focus right now is on Gilmore's contract, as he has threatened to miss time if a new deal does not get done soon. Gilmore is an excellent corner who has displayed some amazing skill over his tenure here in Buffalo, and it's time he gets paid. Overall, what will Buffalo be willing to pay, and more importantly, what is he worth? Let's break it down. There are three main categories in which I value players. Each category is rated out 1-5 (5 of course being the best). At the end, the overall grade of the player will result in how I value said player. Stephon Gilmore is excellent in coverage, more so man-to-man. He is a physical cornerback who can frustrate receivers (ex. Odell Beckham Jr.) as well as hold his own with any receiver. 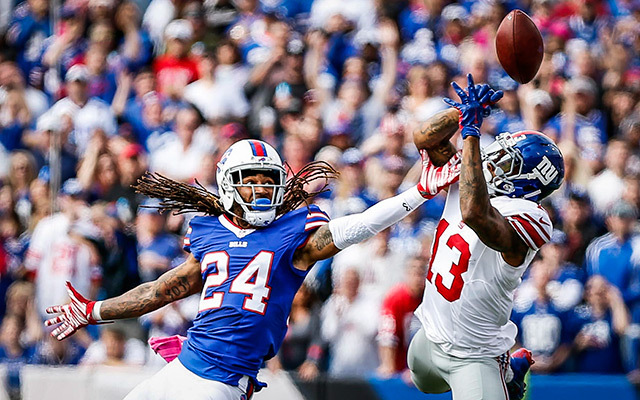 This past season, Gilmore posted 3 picks, 36 tackles, and an impressive 18 passes defended in 12 games. He will challenge a receiver, and adjusts well to the ball. He needs to continue to work on his game though, as Gilmore still struggles with reading shorter routes, such as curls. Overall, his Pass Defense rating is a 4, as he could still perfect his game. Gilmore, as stated above, is a very physical cornerback who is not scared to try and lay a big hit. Gilmore does not play a big role in the run defense as Buffalo's front 7 has been dominant over the past few seasons. Still, his ability to lay a big hit along with his speed allows him to make a stop when needed. His run defense is rated a 3 as his tackling is not perfect, and he is often blocked out of plays. Gilmore needs to utilize his strength to break into the route of the runningback to make a tackle. Despite Gilmore being able to lay out a huge hit at times, his tackling is not the greatest. He is a solid tackler, and relies on technique and form to make a successful tackle. He needs to improve his tackling in space, but overall, his tackling is acceptable. Stephon Gilmore's career has had a lot of injuries, and that may be his biggest downfall as a cornerback. He's missed 11 total games in his 4 year career, having a perfect 16/16 games played only in his rookie year. He's had mainly upper body injuries, such as wrist and shoulder injuries. He's gotta learn to stay on the field to optimize his usage and prove how consistent he can be. I'm grading Stephon Gilmore at a 14/20, which although it seems low, I give more weight to his excellent pass coverage and physical aspect he brings to the game. Gilmore plays a tough game of football, and deserves a big payday for sure. He has the potential, with a few tweaks to his game and of course, health, to become a top 5 cornerback in the NFL. So, that brings up a question, as perhaps a top 10 corner in the NFL, how much is he worth? Ideal Contract: 5 years/$12.5M per year. This is the type of contract I would offer to Gilmore. In my opinion, he is not worth $14m-$15m, especially with 2nd year product Ronald Darby on the rise. It will be interesting to see what Buffalo does, but this is where I value Gilmore. As the Summer finally arrives, the Buffalo Bills have just finished their mandatory mini-camp. A lot went down over the past 3 days, and the Bills believe it's set them up for a great training camp in July. “We’ve won the offseason. I will challenge any team. I think we won the offseason, but we need to win July,” Rex Ryan stated today at practice. The Bills have put in a lot of preparation, and are ready for July to roll around. Let's take a look at some key storylines of the Mini-camp. The 4th year WR looks to make a big leap this season after being plagued by a groin injury nearly all last season. He's had an excellent mini-camp, looking quick, moving well, and making some highlight reel plays. In addition, his route running has also looked solid. Buffalo has a lot of WR's on the roster, and the competition will really be heating up heading into training camp. Buffalo will truly have a tough decision on who to name the #2 receiver behind Sammy Watkins, but odds are, a healthy Woods could be the guy. Gilmore is also entering his 4th year in the NFL, and he's been adamant on his contract situation. Arguably a top 10 CB in the NFL, Gilmore is looking for his big payday, much like Marcell Dareus got last season. Gilmore showed up for the mini-camp after sitting out all of the OTA's. Gilmore is a huge piece to the Buffalo Bills defense, but if they can't come to terms soon, he may be on his way out. Him showing up to mini-camp shows he's willing to cooperate with the team, although he still is standing strong on his desire for a new contract. The 2nd year RB showed up to mini-camp far from ideal football shape. Karlos had a long offseason, as he was taking care of his pregnant wife, often partaking in her cravings, it seems. "He's nowhere close to where he needs to be," Rex Ryan said. The Bills backfield is stacked, and if Karlos doesn't get himself into shape soon, his role could be taken over by the likes of Mike Gillislee, rookie Jonathan Williams, or James Wilder Jr. It will be interesting if Williams can return to the shape he was last year, and continue his short, yet promising career. The Bills are done with any on-field activity until July's training camp. It will be a long wait, but there will be a lot to look forward to. It's only a matter of time until the Bills return for the 2016 season. Thanks for reading, and as always, let's go Buffalo! Fantasy Sports Wolf Click Here!